Green hills and the Mediterranean Sea as a view? 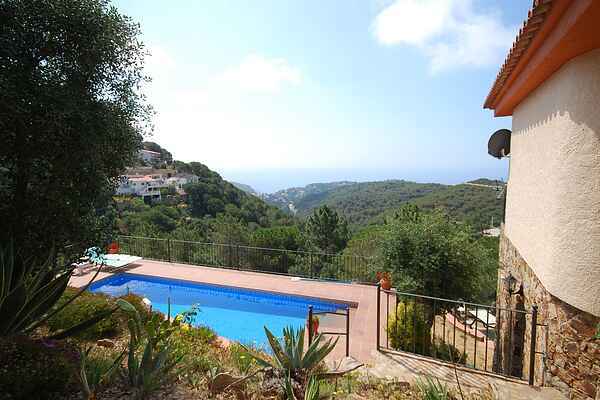 This villa on the ground floor with a well-kept interior in the Serra Brava district of Lloret de Mar has it all! The holiday home is comfortable, close to the beach and has a nice swimming pool. The fenced area has various nice places on different levels. You stay in the upper part of the villa (street level). From the balcony with seating you have the most beautiful view from here and it is a wonderful place for both breakfast and dinner. From outside you reach the private swimming pool with sun terrace via a few steps. A little lower is a great place for the children to play and there is a terrace with seating and a BBQ. Are you looking for something for 10 people? Then you can rent the entire villa, see house code ES-17310-80. The beach of Playa de Canyelles is only 2.5 kilometers away. The busy Lloret de Mar is 4 km away, this is the best place for a shopping trip or evening out! A little further away but surely worth visiting is the village Tossa de Mar (9 km, which is also fun to get to by boat!) and the cities Gerona (46 km) and Barcelona (80 km).